A caring community of teachers and children filled with opportunities for limitless exploration. Separation from home and family is one of the most important developmental issues for 3- and 4-year olds. Our nursery program helps children transition from the familiar world of home to a new community of learning, teachers, and friends. In a safe and caring environment, nursery students build a sense of themselves as individuals and as members of a larger social group. Social and emotional learning is at the core of the 3/4s curriculum. A home visit by teachers and a phase-in period of small-group activities build comfort and confidence. Time in the classroom gradually increases, and children embrace the rhythms of life at school. Teachers help children identify and name their feelings, recognize the impact of their words and actions, and use language to solve problems. Each child builds strategies for coping with strong emotions and communicating with adults and classmates. At this age, children learn by doing, seeing, experiencing, and feeling. 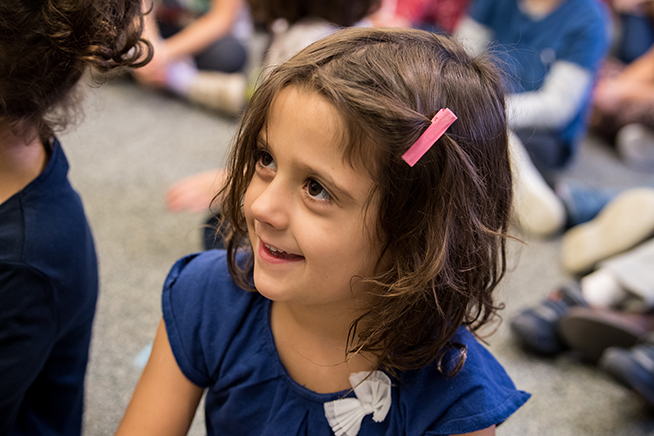 Our nursery curriculum helps children build a sense of self, discover their role within a classroom community, and recognize and appreciate our differences. As they learn through play, children build their gross and fine motor skills, make meaning of their experiences, and learn to express what they learn about the world. Children are encouraged to make choices in their play and to work both individually and in small groups. They use open-ended, sensory materials such as blocks, water-and-sand play, drawing, painting, collage, clay, and small construction materials. As 3/4s students become more comfortable in the classroom, we gradually introduce them to the larger Bank Street community. They begin to visit the Music Room, Movement Room, Library, and participate in Lower School assembly. Our curriculum also draws inspiration from the world outside of Bank Street. We take trips in the neighborhood—going to the market to buy ingredients for cooking, observing sprouting buds and flowers, and collecting photos and nature items. Throughout the year, we talk about how things grow and change, and children discover new talents, abilities, and independence. Children at this age often express interest and skill in recognizing letters, reading, and writing. Teachers support each child in her or his own development and guide children as they take their next steps. Children are encouraged to express their ideas and feelings verbally in one-on-one, small-group, and whole class interactions. Our classroom immerses children in a language-rich environment. Reference resources include alphabet charts, name cards, labels, classroom charts, and visuals. We build our classroom community through song and story. Oral storytelling and picture books open the door to conversations about topics close to children’s own experiences. Puppets tell stories modeled after real events in students’ lives, such as sharing and respecting materials, making friends, and dealing with conflict. As the year progresses, children are encouraged to tell their own original tales and work together on group stories. They act out familiar stories and folktales and the stories they engage with influence their dramatic play. Playing out pretend themes is an important first step in early literacy. It builds language and communication skills and lays the groundwork for later connections between letters and words and the ideas they stand for. As children watch teachers record their words, they begin to see connections between symbols on the page and their own ideas. Children begin to assign meaning to their own marks on paper and to see themselves as writers. 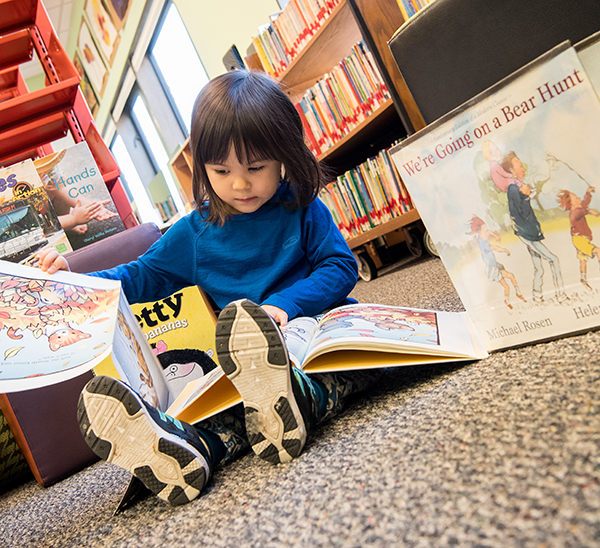 The Lower School Library curriculum focuses on nurturing a love of reading and exposing children to the basics of browsing and checking out books. In the 3/4s, children have regularly scheduled visits to the Library with their teachers to explore its rich resources. They frequently engage in read-alouds with the librarian of developmentally appropriate books that support the 3/4s curriculum. Curiosity and desire to communicate encourage language learning. In the 3/4s, Spanish is offered in an organic way, with no pressure on the children to use it. Immersion in Spanish with minimal translation allows children to acquire language naturally. Children are encouraged to repeat vocabulary and guess at meanings when they aren’t sure. Every attempt to communicate using Spanish is celebrated. Spanish vocabulary at this age is practical and functional, and students use it in daily classroom routines. They also build vocabulary by learning Spanish names for their creations with clay, blocks, and in dramatic play. Spanish is integrated with music and children learn to sing a variety of songs in Spanish during music class, at regular Family Assemblies, and Sing-Along. Lessons are modified to fit the needs of students who already know Spanish. These students are exposed to more complex vocabulary and they are encouraged to produce longer or more complete sentences, depending on their level of proficiency. Mathematics in the 3/4s is active. Manipulatives—such as pegs, beads, and counting cubes—can be grouped by color, arranged in patterns, and counted. Fractions and geometric shapes come to life as children work with unit blocks—discovering that four quarter-circles equal one complete circle. Children count and arrange cups and napkins for the class at snack time and learn to recognize that the numbers in recipes correspond to measurements in cooking. 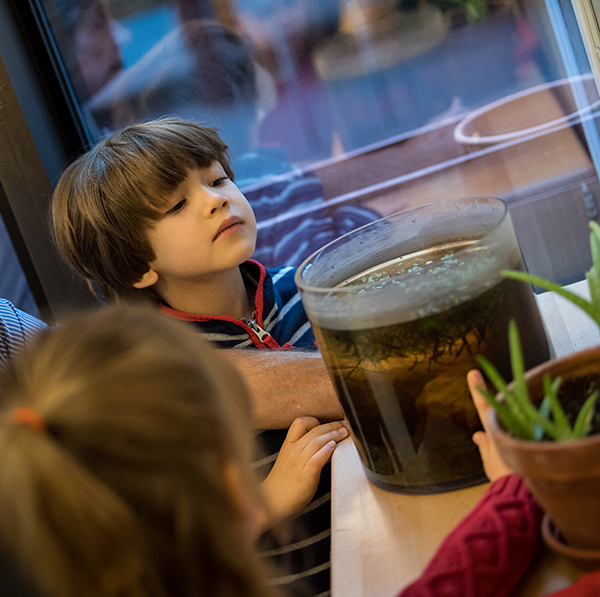 Every day, children in the 3/4s explore and interact with science concepts and engage in the scientific process: making observations, asking questions, and developing and testing theories. Sensory materials such as water, sand, and playdough allow children to discover the distinct properties of materials in the physical world. Building with solid wooden unit blocks, they experience mass and the effects of gravity. They investigate natural materials from the outside environment, which provides an opportunity to learn about changes in the seasons. Other classroom activities support learning about physical and chemical transformations, such as planting seeds and watching them grow, and even cooking. While many of our students have access to tablets, smartphones, and other digital devices at home, our use of technology in the classroom is tailored to our students’ developmental needs. We are conscious of the effects of screen time on young children. Lower School teachers use audio technology to share stories and songs. Images and videos are available to address student needs—for example, to show images and information about a destination for a student’s family trip. Video chatting is available to communicate with members of our community who are away on extended leave. Teachers and students work together to create printed materials for student and class projects. Art materials are integral to the 3/4s classroom curriculum and are used on a daily basis. The art teacher visits the 3/4s classroom once per week. Core materials for 3/4s art include paint, clay, collage, and three-dimensional construction. As children explore these same materials again and again, they build the beginnings of a visual language. Painting: Children are introduced to the tray-painting set-up of brush, water, sponge, and paint cups, beginning with primary colors to maximize discoveries about color mixing and later introducing white and black. As they work, children learn that colors can be mixed on their paper and that the paper is a space that can be covered with paint or organized into distinct areas for shapes, lines, and colors. 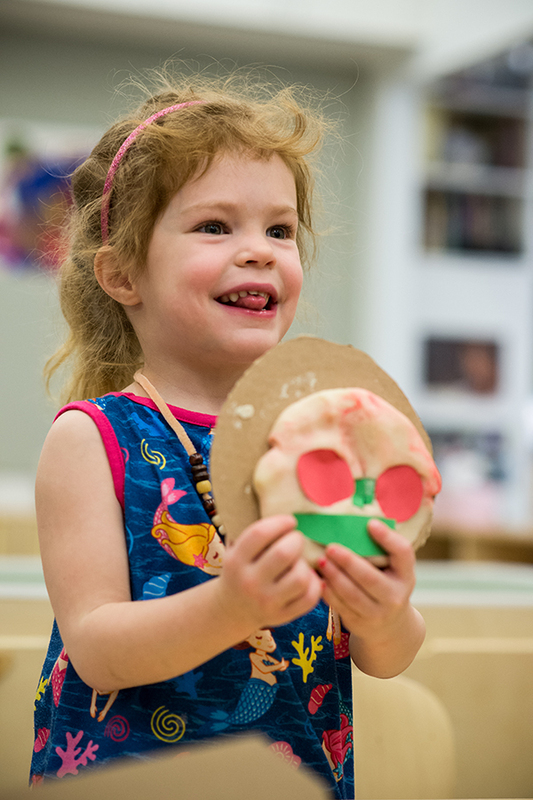 Clay: Children explore clay by poking, pounding, pinching, and rolling, and learn that they can make all kinds of marks, and shapes, and forms with this soft, strong, and malleable material. Clay is highly tactile and can spark storytelling and dramatic play. Because children are interested in process over product, we do not fire clay work in the 3/4s. Children are perfectly happy to return their work to the clay bin at the end of the work period. Collage: Through collage, children explore the tactile and visual properties of a range of materials. They make discoveries and choices about the size, color, shape, and texture of materials and their placement on the paper. Construction: In construction, children explore spatial arrangements of three-dimensional materials. They create wire sculptures, making choices about lines in space, arrangement, and attachment. In a sculpture of recycled cardboard materials, they explore spatial concepts (tall, wide, inside, outside, under, through, low, and high), as well as balance and attachment. The music program in the Lower School weaves together four “pillars” of music: singing, dancing, playing, and inquiry. The 3/4s experience music in four settings. They sing together in their classroom and once a week in the music room. 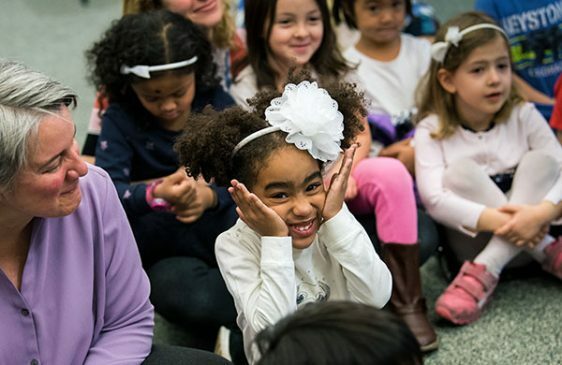 They also participate in the bimonthly Lower School Family Singing Assembly in the lobby and once a month they join the 4/5s for a Sing-Along in the Children’s Dining Room. 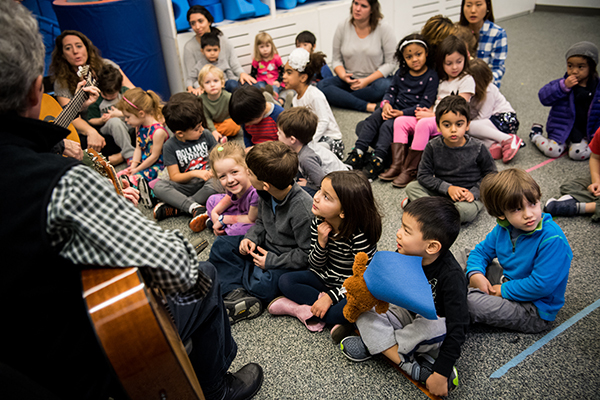 In the classroom, children learn new songs and sing old favorites. There is also time for body percussion activities and a dancing game or two. Occasionally, a song that starts in a spontaneous way will lead the group to make up a song. During these activities, the music teacher works on developing students’ singing range and tone quality and introducing new words in Spanish and English. As the children establish repertoire for future assemblies, they find time to make personal song choices and suggest new words for songs. In the music room, 3/4s focus on gross motor movement to music, including skipping, jumping, marching, tiptoeing, and moving together. They practice starting and stopping with both bodies and instruments. They learn singing games to accompany their dancing and are introduced to a myriad of instruments, one family at a time. The instruments that 3/4s play include all sizes of drums played with hands, tambourines, maracas, and assorted non-pitched percussion. In the late fall, the Orff instruments (pitched percussion, specifically, xylophones) are introduced and played with one or two mallets. After the group “sound” settles, there are opportunities for observations, suggestions, and individual discoveries. By spring, the 3/4s are learning singing games for Field Day and playing instruments as a “together” band. They choose the songs that they accompany and, all the while, they are learning to hear and to respond to the changes in dynamics, mood, and tempo. A goal of the 3/4s music curriculum is for children to try to hear one’s individual sound, as well as the group sound. Movement classes for the 3/4s develop fine and gross motor skills, build impulse control, and foster self-concept and self-esteem. The 3/4s have movement for 30 minutes once a week as a full group in the Children’s Dining Room. The fundamental movement concepts of space, time, and energy are introduced. The focus is on developing balance, coordination, and spatial awareness. Over the year, the exploration and evolution of these concepts take on different forms through pictures, movement games, songs, stories, and improvisations. Children build their movement vocabulary (walk, jump, hop, skip, gallop, spin, roll, crawl) and use props (ribbons, scarves, balance beams, tunnels, and bouncing balls) to inspire their movement. By spring, students are improvising dances inspired by Carole Lexa Schaefer’s book The Squiggle. They create magical images with ribbons as the “squiggles” come to life. Children are later introduced to the imaginative improvisation/freeze dance game Museum. At the end of the year, the 3/4s learn the Maypole song and dance for Lower School Field Day to build their understanding of their role in the community and develop a greater sense of self in the world. Students in the nursery program learn about sharing and friendship. They are problem-solvers and helpers and have jobs such as taking care of the classroom pets and plants.